The Silver Star harmonicas are designed for blues, rock, country and jazz. It’s a nice-looking harp, with a durable tan comb and stainless steel chrome covers top and bottom. It has excellent note stability and pro reed plates. Hand-assembled for quality control. 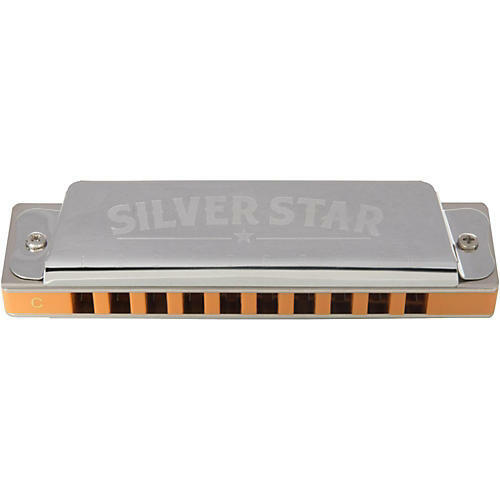 Designed for rich tone and superior palette of musical expression, the Silver Creek Silver Star Harmonicas are 10-hole diatonic instruments that come in 5 of the most popular keys (A, C, D, E, and G). You can play in nearly every musical genre, on stage or in the studio. The smooth comb and extra-thick reed plate give this hand-assembled instrument solid tone and superior playability for years to come. And the contoured cover plate offers outstanding volume and solid resonance throughout the scale. Now you can own a pocket-sized, top-quality portable instrument that is ready to play at any time, anywhere.